Cody Willoughby | AIM Media Midwest Jon Pickering and son, Jon Jr., of Troy, survey dragsters currently being worked on in their residential garage, as part of the Pickering Family Racing outfit that has now spanned 50 years. 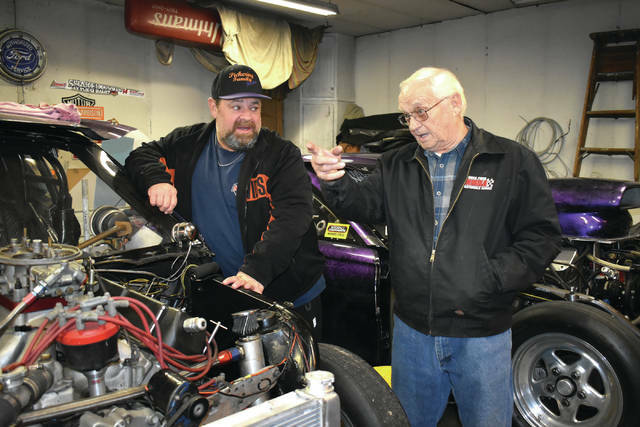 TROY — For most of us, age 80 is a time to slow down, but a passion for drag racing is keeping Miami County resident Jon Pickering running at full speed. Pickering and his family participate in the National Mustang Racing Association circuit, attending drag races in six different states during the regular season, which spans from February to September. Pickering, who was born and raised in Piqua, worked in appliance repair in Miami County for more than 40 years before retiring in 2003. Since then, Pickering, son Jon Jr. and other members of the family have continued to customize their drag racing vehicles in Pickering’s garage. Fortunately, the Pickerings have never experienced any major crashes, though they’ve had the occasional close shave. The Pickerings have won numerous prizes throughout their tenure with the NMRA, including a car in 2000 and a Wally award (named after Wally Parks of the National Hot Rod Association) in 2012. The Pickerings claim, however, that their drive to continue comes from their love of competition and community. The Pickerings’ next race will take place at Gateway Motorsports Park in Madison, Illinois, on Feb. 28, 2019. For more information, visit Pickering Family Racing on Facebook. https://www.dailycall.com/wp-content/uploads/sites/30/2018/11/web1_PickeringRacing1-1.jpgCody Willoughby | AIM Media Midwest Jon Pickering and son, Jon Jr., of Troy, survey dragsters currently being worked on in their residential garage, as part of the Pickering Family Racing outfit that has now spanned 50 years.